The shape of the gold-plated clip references the once-patented screw clamps used for bending the grand piano rim into its distinctive sweeping curve. The name *Steinway & Sons*, found above the keyboard of every piano produced by Steinway, is immortalized as a fine engraving on the gold-plated cone ring, while the 750 gold nib is intricately engraved with a portrait of Henry E. Steinway himself, capturing the noble aspects of his character: determination, perfectionism and passion. 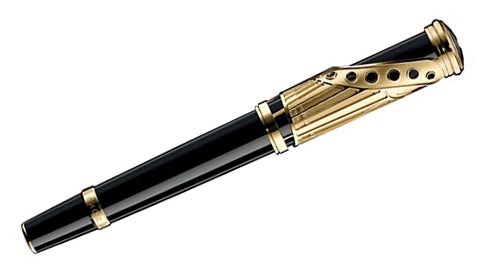 The Montblanc emblem in black and white precious resin crowns the fountain pen.